Left to right: Kim Cussans, Ann Evans, Joyce Clark, Linda Kendall and Gwen Bennett. 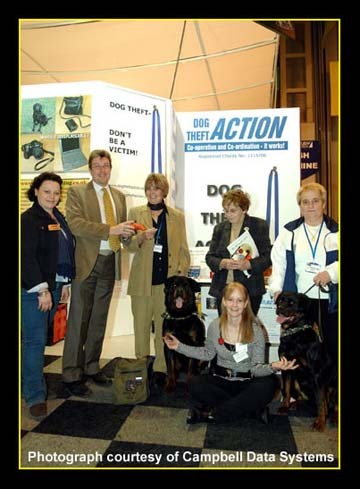 Saturday 8th March 2008.Donated by Dog Theft Action. two of Ann's Rottweilers representing the breed. (L to R )Linda Kendal, Kim Cussans, The Boss, And (again!) Gwen Bennett. for which we are so very grateful.